Copper Harbor, MI is located near the tip of the Keweenaw Peninsula, on the south coast of Lake Superior. The Keweenaw Peninsula is a unique geological lava formation and its creation over a million years ago resulted in one of the most significant copper fields in the entire world. Mined by aboriginal peoples for a millenia, the copper industry became a huge magnet for businesses and immigrant, drawing people from as far away as Finland and Wales. Copper Harbor got its start in 1844 when a small copper mining firm began operations in the surrounding area. The harbor was a well-protected and natural place to both receive people and supplies as well as to ship copper ore out. Copper mining continued to grow, helped by the construction of the Soo locks in 1855 and the expansion of the railroad system. However, by 1900, the 'copper rush' had run its course. Copper Harbour became a small, sleepy village on the edge of the great inland sea. The area is an outstanding natural region. As the copper mining industry wound down, tourism emerged as a major economic support. The region abounds with walking and hiking trails, spectacular views and outdoor recreational opportunities. It is an important stopover for cruising sailors and is also a gateway to beautiful Isle Royale, the second largest island in the Great Lakes that now is a national park. The entrance into Copper Harbor MI lies between rocky shoals and a reef, a passage that can be tricky to navigate. make the start of your entry the RW bell buoy marked "CH". From "CH", lay a course of 190°T. There is a charted range but be aware that it can be hard to find. Stay on that course of 190°T from buoy "CH". Once in the middle of the bay, alter course to starboard and head for the harbor.Hold your course to the middlle of the bay. The principal docking area for recreational vessels is Copper Harbor State Dock, on the west side of the village. Note also the ORANGE/WHITE buoy marking the Copper Harbor shoal (47° 28.284N 087° 53.7W). It is approximately 120 ft/37 m NE of the main pier of Copper Harbor State Dock. Copper Harbor State Dock is operated by the State of Michigan's Department of Natural Resources which pretty much ensures that it is clean, well-kept and has all of the necessary facilities. 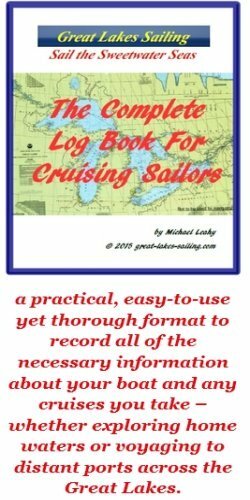 There are about 15 slips available for cruising sailors. There is a fuel dock (diesel and gasoline) and a pumpout station. Water and power are available at each slip. There are restrooms and showers in the marina building. A laundromat is located near the marina. There is a gift shop and telephone in the marina building. The latter is important because there is no cell phone service in this remote community. The village center is about .67 mi/1 km east. There are a couple of other small docking areas closer to the village center. However, water depths can be tricky and these have no services at all. There is a charted anchor ground to the north of the Copper Harbor shoal warning buoy. There are no repair or maintenance facilities in Copper Harbor MI. Gas Lite General Store has basic provisions and is located on the east side of the village, about .85 mi/1.4 km. If you have a dinghy, it might be easier to use it to get closer to the store. There are no medical facilities in Copper Harbor MI. The Harbor Haus is well-known and very popular with sailors transiting through. With a very German/Austrian flavor, the Harbor Haus offers excellent foods, wines and beer in a great location overlooking Lake Superior. Every evening, as the Isle Royale ferry passes by, the staff gather on a patio to do a can-can dance to greet her - a long-standing tradition at the Harbor Haus. The Berry Patch is well-known for its delicious ice cream. The historic Keweenaw Mountain Lodge has an excellent menu, serves breakfast, lunch and dinner and may send a car to pick you up at the marina. The Pines Restaurant and the Tamarack Inn are both within the village. Copper Harbor MI is very proud of its hardy spirit, sitting as it does on the fringe of a great northern inland sea. The surrounding landscape is breathtaking. There is plenty to do and see, including doing nothing at all! Copper Harbor offers good shopping in its gift and antique shops, dining, hiking, biking, kayaking, beach-combing and fishing. One advantage here is the length of the days - by mid-summer, 16 hours of daylight! East of the village is Fort Wilkins State Park. Built in 1844, it was garrisoned until 1869. It is beautifully restored and has a very good interpretation/visitors center showing life as it was in this isolated mining community. If you would enjoy a visit to Isle Royale without a day at the helm, there is a daily ferry you can take for a day visit (and be treated to a can-can dance welcoming you home in the evening!). Isle Royale is the second largest island in the Great Lakes and is a breath-taking wilderness area. The Copper Harbor MI tourism site will give you ideas of more things to do and see while visiting the area.